The objective of this study was to evaluate the effects of adding fentanyl or epinephrine to bupivacaine in ultrasound-guided transversus abdominis plane (TAP) block for lower abdominal surgeries. These effects include quality and duration of the analgesia and opioid consumption. TAP block provides analgesia to the anterior abdominal wall. Many adjuvants were used to improve the quality and duration of analgesia in various nerve blocks. Fifty-six adult patients undergoing elective lower abdominal surgeries under general anesthesia received TAP block with 20 ml of local anesthetic mixture bilaterally and were randomly allocated according to the local anesthetic mixture into three groups: group B (bupivacaine), group BE (bupivacaine + epinephrine), and group BF (bupivacaine + fentanyl). The primary outcomes were postoperative pain (evaluated by time to first analgesia request and visual analog scale) and opioid consumption (intraoperative fentanyl and morphine in 24 h postoperatively). The secondary outcomes were effect on hemodynamics, time of extubation, and side effects. Time to first analgesia request was longer in group BF, postoperative visual analog scale was lower in group BF after 4 h, the use of intraoperative fentanyl was lower in group BF, and morphine consumption 24 h postoperatively was lower in group BF. Time of extubation was shorter in group BF, and intraoperative mean arterial pressure decreased at 30 min in group B and group BF. The addition of fentanyl to the local anesthetic in ultrasound-guided TAP block prolongs the analgesia, lowers postoperative pain, and decreases the opioid consumption. Adding epinephrine prevents reduction of mean arterial pressure without additional effects on the block characteristics. Transversus abdominis plane (TAP) block is a relatively new regional anesthesia technique that provides analgesia to the parietal peritoneum, as well as skin and muscles of the lower anterior abdominal wall. Rafi  first described the TAP block in 2001 with a targeted single-shot anesthetic delivery into the TAP, a site traversed by relevant nerve branches, utilizing surface anatomical landmark – i.e. 'the lumbar triangle of Petit'. Later on, several studies were published on TAP block and brought an evidence to support the anatomical basis and analgesic effect of the block ,,. In 2007, Hebbard et al. described an ultrasound-guided approach to the TAP block. Ultrasound guidance offers the advantage of direct visualization of the needle and of the placement of local anesthetic, which improves efficacy and safety . Recent researches have focused on prolongation of the analgesia provided by the block. Catheter techniques and the use of both existing and experimental longer-acting local anesthetics may provide safe and efficacious postoperative analgesia for abdominal surgeries . Local anesthetic infusion dosing and potential toxicity in addition to success of various adjuvants in improving the quality and increasing the duration of different peripheral nerve blocks and regional anesthetic techniques promoted studying the use of adjuvants in TAP block. The current study was carried out after a written informed consent was obtained from all patients and approved by the Research Ethics Committee of the Faculty of Medicine, Menoufia University. 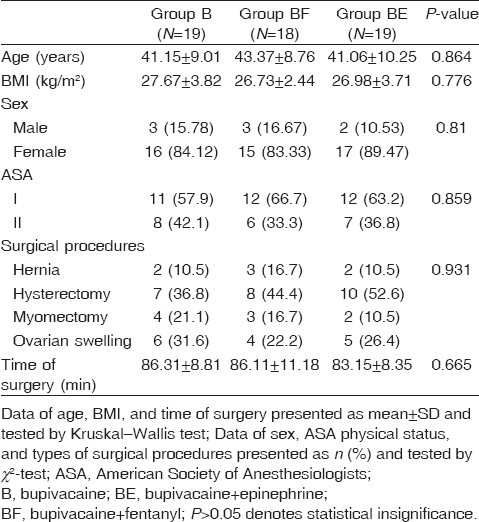 It was planned to include 60 American Society of Anesthesiologists scores I or II patients in the age group of 18–60 years undergoing elective lower abdominal surgeries, starting from January 2013 to May 2015. Exclusion criteria were pre-existing coagulation disorders, known allergies against aminoamide local anesthetics, local infection at the site of block, morbid obesity, laparoscopic surgeries, extension of the laparotomy incision above the umbilicus, or severe surgical bleeding requiring blood transfusion. Group B received ultrasound-guided TAP block with 20 ml of bupivacaine 0.25% bilaterally. Group BF received ultrasound-guided TAP block with 20 ml of bupivacaine 0.25% and 50 μg of fentanyl bilaterally. Group BE received ultrasound-guided TAP block with 20 ml of bupivacaine 0.25% and epinephrine 5 μg/ml bilaterally. Randomization was performed centrally by an independent statistician using a random number table generated by Microsoft Excel to ensure proper concealment of the study management from the patients and investigators until the release of the final statistical results. The injectate in all groups was prepared by an independent anesthesiologist not involved in patient care, block performance, or data collection. During the preoperative anesthetic assessment, visual analog scale (VAS) for pain assessment from 0 to 10 cm (with 0 meaning no pain and 10 meaning the worst pain imaginable) was explained to patients. Midazolam 0.03 mg/kg was administered intravenously 20 min before induction of general anesthesia. Baseline mean arterial pressure (MAP) and heart rate (HR) values were taken just before induction of general anesthesia. No prophylactic anti-emetic was given. Patients were monitored by ECG, pulse oximetry, capnography, noninvasive blood pressure, bispectral index score, and urine output. For all patients, general anesthesia was induced with fentanyl 1.5 μg/kg, thiopental sodium 6 mg/kg, and pancuronium 0.8 mg/kg. Subsequently, the trachea was intubated. General anesthesia was continued with lung ventilation by volume-controlled mode, and isoflurane/O2 mixture was administered (keeping bispectral index score between 40 and 60). Intravenous fluid requirements (fasting and maintenance needs) were calculated and given to the patients throughout the procedure. Blood loss was estimated and compensated. After induction of anesthesia, the skin was prepped with 10% povidone iodine solution. TAP block was performed under dynamic ultrasound guidance using broadband linear array ultrasound probe (7.5–12 MHz, A5; SonoScape Medical Corp., Shenzhen, China). With the patient in supine position, the ultrasound probe was placed in a transverse plane to the lateral abdominal wall between the lower costal margin and the iliac crest at the midaxillary line. The three muscle layers (external oblique, internal oblique, and transversus abdominis) of the anterior abdominal wall were identified. After identification of the neurofascial plane between the internal oblique and the transversus abdominis muscle, an 18-G, 90 mm Tuohy needle (Perican; B. Braun, Melsungen, Germany) was introduced anteriorly in the plane of the ultrasound beam 2–3 cm medial to the probe until its tip was located in between the internal oblique and transversus abdominis muscles. Careful aspiration was performed before injection to exclude vascular puncture. Two milliliters of normal saline was injected to confirm correct placement of the needle, and then the local anesthetic was injected. The injectate was seen spreading in the TAP as a hypoechoic oval shape. The TAP block was then performed on the opposite side, using the same technique and the same injectate. Hemodynamics was recorded at 5, 10, 15, 30, and 60 min after the block. Both HR and MAP were kept within 70–120% of their preanesthesia values; for increase in HR and/or MAP, fentanyl 1 μg/kg was administered. The total amount of fentanyl administered (including the induction dose) and the number of patients who needed additional doses of fentanyl were recorded. For decrease in MAP that could not be controlled by adjusting the anesthetic depth, ephedrine (6 mg) was given and repeated every 5 min if needed. For decrease in HR, atropine (0.01 mg/kg) was given. Number of patients who needed ephedrine and/or atropine and total amount of their administration were recorded. At the completion of the surgery, isoflurane was discontinued. The neuromuscular blockade was reversed with intravenous neostigmine 0.04 mg/kg with an appropriate dose of atropine. The time required to extubate the patient after isoflurane discontinuation was recorded. Postoperatively, VAS, MAP, HR, and sedation score were recorded on admission to postanesthetic care unit and after 1, 2, 4, 8, 12, and 24 h postoperatively. Time to first analgesia request (TFAR) was recorded. It was defined as the time from the completion of TAP block to first given rescue morphine dose when VAS was 5 or more. Thereafter, analgesia was maintained using morphine on demand (2 mg intravenous to be repeated after 20 min if VAS > 5 until a maximum of 4 mg/h) and diclofenac sodium 75 mg/12 h intramuscular. The total amount of morphine consumed in the postoperative 24 h was recorded. After 2 and 24 h, the sites of injection of the TAP block were examined to detect complications such as hematoma or infection. Incidences of postoperative nausea and vomiting (PONV) and pruritus were recorded. Inverted Observer Assessment of Alertness/Sedation scale was used to assess sedation level, with a score of 1, completely awake; 2, awake but drowsy; 3, asleep but responsive to verbal commands; 4, asleep but responsive to tactile stimulus; and 5, asleep and unarousable. The patients, anesthesiologists, and the observers who recorded the postoperative data were blinded to the group assignment. The primary outcomes were postoperative pain (evaluated by TFAR and VAS) and opioid consumption (intraoperative fentanyl and morphine consumption in the postoperative 24 h). The secondary outcomes were hemodynamics, use of atropine and ephedrine, time for extubation, postoperative sedation, occurrence of PONV, pruritus, and local complications. Data were collected, tabulated, and statistically analyzed by using MedCalc Statistical Software (version 15.8, 2015; MedCalc Software bvba, Ostend, Belgium). Normality of a numerical data distribution was tested using the Kolmogorov–Smirnov test. Continuous variables were expressed as mean ± SD or median with interquartile range as appropriate. x2-test was used to compare nominal data, Kruskal–Wallis test with post-hoc analysis was used to compare numerical data between groups, and paired t-test was used to compare measures within the same group. All analyses were two-tailed, and P less than 0.05 was considered statistically significant. Four patients were dropped: three patients because of surgical bleeding requiring blood transfusion and one patient because of extension of the surgical incision above the umbilicus, the reliable level of the block [Figure 1]. Patients' demographic and operative data were comparable between groups [Table 1]. Figure 1: Consort of the study. Fentanyl use was lower in group BF regarding the total amount (108.3 ± 24.3 μg in group BF vs. 133.7 ± 41.5 and 136.8 ± 40.4 in group B and group BE, respectively, P = 0.047) and the number of patients who needed additional doses of fentanyl (two in group BF vs. eight and nine in group B and group BE, respectively, P = 0.043) [Table 2]. TFAR was longer in group BF (325.1 ± 90.9 in group BF vs. 242.6 ± 46.5 and 235.26 ± 50.8 in group B and group BE respectively, P = 0.008) [Table 2]. Postoperative VAS values were lower in group BF after 4 h (P = 0.001) [Figure 2]. Morphine consumption in the postoperative 24 h was lower in group BF (14.2 ± 3.5 in group BF vs. 18.9 ± 4.1 and 17.4 ± 4.1 in group B and group BE, respectively, P = 0.003) [Table 2]. Time for extubation was shorter in group BF (9.01 ± 2 in group BF vs. 10.8 ± 2 and 10.9 ± 1.7 in group B and group BE respectively, P = 0.009) [Table 2]. 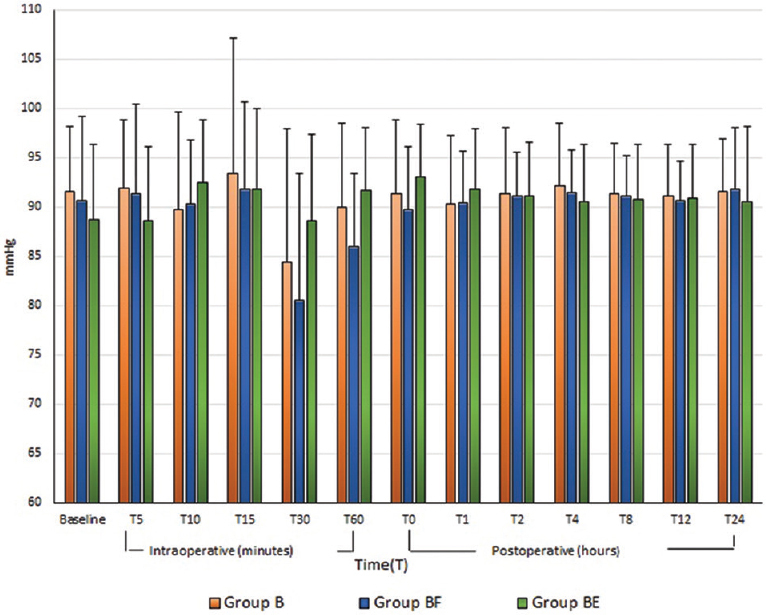 Intraoperative MAP was significantly higher in group BE at 30 min after the block (P = 0.006). 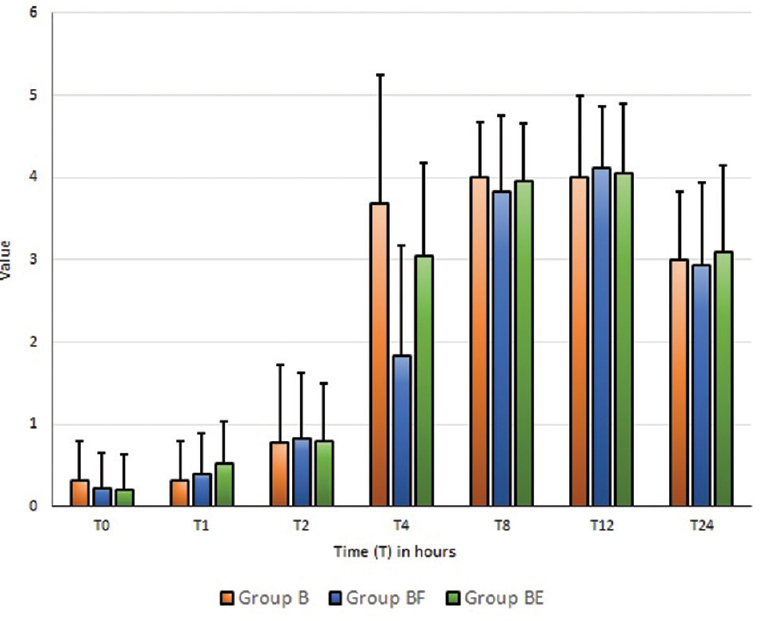 Within the groups, intraoperative MAP measurements significantly decreased at 30 min after the block in group B and group BF in comparison with the baseline (P = 0.012 and 0.007, respectively), but not in group BE (P = 0.245) [Figure 3]. 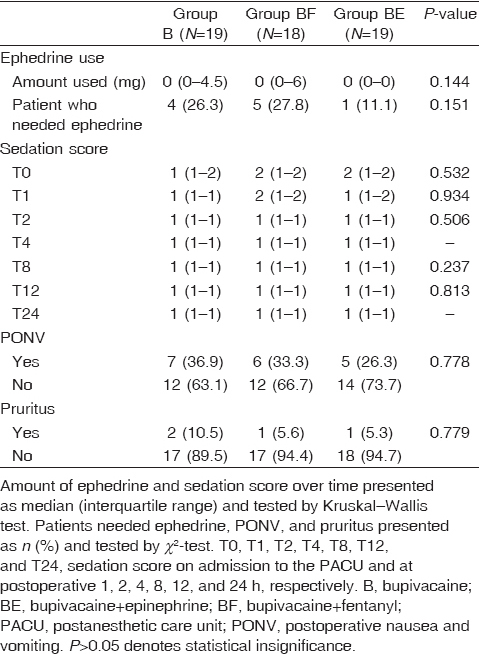 There were no significant differences in ephedrine use [Table 3]. There was no significant change in HR, and no atropine was needed. There were no significant differences in postoperative sedation score, incidence of PONV, and pruritus [Table 3]. No local complications were reported. Figure 2: Statistical graph representing time course of visual analog scale. Figure 3: Statistical graph representing time course of mean arterial pressure. The current study showed that the use of fentanyl as an adjuvant to bupivacaine significantly reduced intraoperative fentanyl use regarding both the amount and the number of patients who needed additional doses. TFAR was significantly longer in group BF. Visual analog score was significantly low in group BF after 4 h postoperatively. At 8 h postoperatively and thereafter, VAS became comparable between the three groups mostly in modest levels. Morphine requirements in the postoperative 24 h were significantly lower in group BF. Most of the previous studies reported that TAP block with local anesthetic alone decreases intraoperative need of opioids and prolonged postoperative analgesia of the TAP block, resulting in reduced postoperative opioid requirements ,,. McDonnell et al. in their study contributed the prolonged effect of local anesthetic in TAP block to the relatively poorly vascularized TAP resulting in a slow rate of drug clearance. The addition of fentanyl to bupivacaine in the TAP block led to further decrease in the need for fentanyl and has improved the quality of the sensory block, further prolongation of analgesia, lower pain scores, delayed requirement of rescue morphine, and subsequently less total morphine used. Several studies reported improved peripheral nerve blocks by using fentanyl as an adjuvant regarding quality of sensory block and duration of the block as in studies conducted by Mane et al. , Chavan et al. , and Sert et al. . On the other hand, studies by Kalso et al. , Picard et al. , and Magistris et al. reported that adding fentanyl or other opioids did not provide clinically relevant advantages for peripheral nerve blocks. In the current study, it is still unclear whether the effect produced by the addition of fentanyl to bupivacaine was because of local or systemic action. These results may be related to the peripheral effects of opioids. The lipid solubility of fentanyl is thought to have had a perineural effect. Systemic effect of fentanyl should be in mind, as slow absorption of fentanyl added to bupivacaine may improve and prolong the analgesic effect, specially the visceral part of pain, which is not affected by TAP block. No previous researchers studied the effect of fentanyl as an adjuvant in TAP block to the best of our knowledge, and it may need future research to reveal the exact mechanism and site of this action. Other adjuvants such as dexamethasone, dexmedetomidine, and tramadol were used in previous studies by Ammar and Mahmoud , Almarakbi and Kaki , and El-Kabariety , respectively. They all gave similar results but with more reduction of morphine consumption, and lower VAS for more time. This may indicate that fentanyl has a shorter time of action. With regard to time for extubation, it was reduced by using fentanyl as an adjuvant and was significantly shorter in group BF than in the other two groups. In a study conducted by Chen et al. , time of extubation was significantly shorter using TAP block. More reduced time of extubation by using fentanyl as an adjuvant in group BF may be referred to less use of intravenous fentanyl with its respiratory depressing effect. Similar results were attained by using tramadol as an adjuvant in a study conducted by El-Kabariety . This implies a faster patient turnover rate, which is especially beneficial in ambulatory care settings. Epinephrine's vasoconstrictive effect augments local anesthetics by antagonizing inherent vasodilating effect of many local anesthetics, decreasing systemic absorption and intraneural clearance, and perhaps by redistributing intraneural local anesthetic . The extent to which epinephrine prolongs the duration of anesthesia depends on the specific local anesthetic used and the site of injection. Epinephrine will significantly extend the duration of both infiltration anesthesia and peripheral nerve blockade with shorter duration agents (e.g., lidocaine); epinephrine produces mild intensification of blockade but only most modest prolongation of epidural or peripheral blocks with bupivacaine . In the current study, adding epinephrine to bupivacaine showed no additional benefits on either opioid consumption or the block characteristics. Similar results were reported by Corvetto et al. . On the other hand, epinephrine significantly decreased the drop of intraoperative MAP 30 min after the block recorded in other two groups. The decrease in blood pressure may be referred to the absorption of bupivacaine. In the current study, plasma level of bupivacaine was not assessed because of the lack of availability of the kits, but this hypothesis may be supported by the studies conducted by Griffiths et al. , as they reported a maximum plasma of ropivacaine 30–60 min after TAP block in patients who underwent cesarean section and genealogical surgeries. In addition, Corvetto et al. reported that adding epinephrine to levobupivacaine decreased its peak plasma concentration after unilateral TAP blocks. This may explain the lack of decrease of blood pressure in the group BE as epinephrine hindered the absorption of the bupivacaine. Subsequently, less patients needed ephedrine with less amount used in group BE, although it was not statistically significant. Generally, the low need of ephedrine and atropine in TAP block despite the use of large volume of local anesthetic indicates relative safety of the procedure. The block would be relatively safer with the use of epinephrine as an adjuvant. On other hand, lack of significant rise of blood pressure and HR indicate the good analgesic effect of the block resulting in hemodynamic stability. Hemodynamic stability is reported with the use of TAP block even in high-risk patients with American Society of Anesthesiologists score III with cardiovascular disease in a study conducted by Tsuchiya et al. . The use of either fentanyl or epinephrine as adjuvants in TAP block has no effect on sedation score, with no cases of severe sedation being reported. Also, the addition of both adjuvants has no effect on the incidences of PONV or pruritus. In previous studies, other adjuvants such as dexamethasone and tramadol were reported to cause a significant decrease of PONV with lower sedation score ,. The addition of fentanyl as an adjuvant to bupivacaine in TAP decreases the need of intraoperative fentanyl, prolongs the time for first rescue analgesic, lowers postoperative pain scores, decreases the postoperative morphine consumption, and shortens the time of extubation. The addition of epinephrine as an adjuvant to the bupivacaine reduces the chance of decrease of MAP caused by the local anesthetic, with no remarkable effects on block characteristics or duration. Rafi AN. Abdominal field block: a new approach via the lumbar triangle. Anaesthesia 2001; 56:1024–1026. McDonnell JG, O'Donnell BD, Farrell T, Gough N, Tuite D, Power C, Laffey JG. Transversus abdominis plane block: a cadaveric and radiological evaluation. Reg Anesth Pain Med 2007; 32:399–404. Hebbard P, Fujiwara Y, Shibata Y, Royse C. Ultrasound-guided transversus abdominis plane (TAP) block. Anaesth Intensive Care 2007; 35:616–617. Mamdouh L, Ghada H, Zalat I, Aiad A, Elhennawy A. Effect of addition of dexamethasone to low volumes of local anaesthetics for ultrasound-guided supraclavicular brachial plexus block. Menoufia Med J 2015; 28:928–934. Taylor R Jr, Pergolizzi JV, Sinclair A, Raffa RB, Aldington D, Plavin S, Apfel CC. Transversus abdominis block: clinical uses, side effects, and future perspectives. Pain Pract 2013; 13:332–344. McDonnell JG, Curley G, Carney J, Benton A, Costello J, Maharaj CH, Laffey JG. The analgesic efficacy of transversus abdominis plane block after cesarean delivery: a randomized controlled trial. Anesth Analg 2008; 106:186–191; table of contents. Mane RS, Sanikop CS, Dhulkhed VK, Gupta T. Comparison of bupivacaine alone and in combination with fentanyl or pethidine for bilateral infraorbital nerve block for postoperative analgesia in paediatric patients for cleft lip repair: a prospective randomized double blind study. J Anaesthesiol Clin Pharmacol 2011; 27:23–26. Chavan SG, Koshire AR, Panbude P. Effect of addition of fentanyl to local anesthetic in brachial plexus block on duration of analgesia. Anesth Essays Res 2011; 5:39–42. Sert H, Muslu B, Usta B, Colak N, Irem Demircioglu R, Gozdemir M. A comparison of articaine and fentanyl-supplemented articaine for hemodialysis fistula creation under ultrasound-guided axillary block. Ren Fail 2011; 33:280–284. Kalso E, Smith L, McQuay HJ, Andrew Moore R. No pain, no gain: clinical excellence and scientific rigour – lessons learned from IA morphine. Pain 2002; 98:269–275. Picard PR, Tramèr MR, McQuay HJ, Moore RA. Analgesic efficacy of peripheral opioids (all except intra-articular): a qualitative systematic review of randomised controlled trials. Pain 1997; 72:309–318. Magistris L, Casati A, Albertin A, Deni F, Danelli G, Borghi B, Fanelli G. Combined sciatic-femoral nerve block with 0.75% ropivacaine: effects of adding a systemically inactive dose of fentanyl. Eur J Anaesthesiol 2000; 17:348–353. Ammar AS, Mahmoud KM. Effect of adding dexamethasone to bupivacaine on transversus abdominis plane block for abdominal hysterectomy: a prospective randomized controlled trial. Saudi J Anaesth 2012; 6:229–233. Almarakbi WA, Kaki AM. Addition of dexmedetomidine to bupivacaine in transversus abdominis plane block potentiates post-operative pain relief among abdominal hysterectomy patients: a prospective randomized controlled trial. Saudi J Anaesth 2014; 8:161–166. El-Kabariety R. Tramadol as an adjuvant to levobupivacaine in an ultrasound-guided transversus abdominis plane block in women undergoing abdominal hysterectomy. Ain-Shams J Anaesthesiol 2013; 6:304–3011. Chen CK, Tan PC, Phui VE, Teo SC. A comparison of analgesic efficacy between oblique subcostal transversus abdominis plane block and intravenous morphine for laparoscopic cholecystectomy. A prospective randomized controlled trial. Korean J Anesthesiol 2013; 64:511–516. Sinnott CJ, Cogswell LP III, Johnson A, Strichartz GR. On the mechanism by which epinephrine potentiates lidocaine's peripheral nerve block. Anesthesiology 2003; 98:181–188. Eisenach JC, Grice SC, Dewan DM. Epinephrine enhances analgesia produced by epidural bupivacaine during labor. Anesth Analg 1987; 66:447–451. Corvetto MA, Echevarría GC, De La Fuente N, Mosqueira L, Solari S, Altermatt FR. Comparison of plasma concentrations of levobupivacaine with and without epinephrine for transversus abdominis plane block. Reg Anesth Pain Med 2012; 37:633–637. Griffiths JD, Barron FA, Grant S, Bjorksten AR, Hebbard P, Royse CF. Plasma ropivacaine concentrations after ultrasound-guided transversus abdominis plane block. Br J Anaesth 2010; 105:853–856. Griffiths JD, Le NV, Grant S, Bjorksten A, Hebbard P, Royse C. Symptomatic local anaesthetic toxicity and plasma ropivacaine concentrations after transversus abdominis plane block for Caesarean section. Br J Anaesth 2013; 110:996–1000. Tsuchiya M, Takahashi R, Furukawa A, Suehiro K, Mizutani K, Nishikawa K. Transversus abdominis plane block in combination with general anesthesia provides better intraoperative hemodynamic control and quicker recovery than general anesthesia alone in high-risk abdominal surgery patients. Minerva Anestesiol 2012; 78:1241–1247.